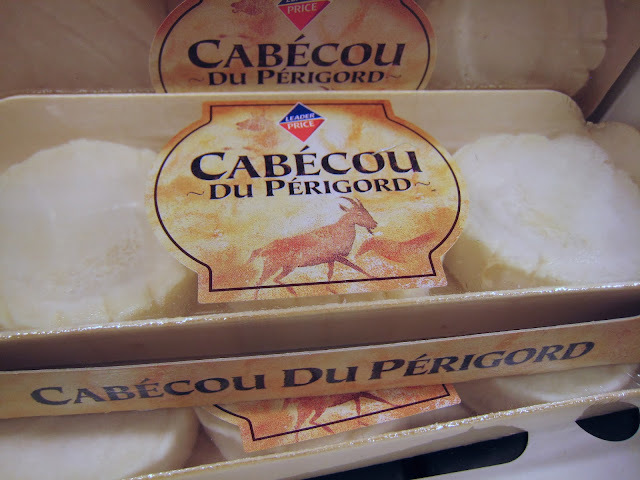 Cabécou comes from the Perigord, just like its AOC sister version Rocamadour. It's a small raw goat's milk cheese that's so creamy, it's on the verge of becoming a liquid. The flavor is very mild, somewhere between butter and cream cheese with just a hint of goat that becomes more pronounced the older it gets. The name Cabécou comes from the old local language of southern France, langue d'Oc, in which a "cabécou" meant a small goat. Appropriately, it's a small cheese, about the size of a hockey puck. This cheese, originally called Cabécou or Cabécou de Rocamadour, is one of the oldest products of the region. It originated in the village of Vierge Noire and has been documented since the 15th century. In a monograph from this era, these little discs of cheese were cited for their value on tax documents. I usually see them in the stores young and very white on the outside. This is when they're at their creamiest and sweetest. They can also be served more aged, at which point they get moldier, furrier, harder, more pungent, and more hockey puck-like. In researching this, I've discovered there's even a version rapped in leaves, sprayed with plum liquor, stored in an airtight container, and topped with crushed pepper. This version has its own name, Picadou, and now I'm going to have to seek it out for a future posting. It's either going to be frightening, or delicious, or both. Why are some cheeses labeled AOC? Do you know that all champagne in the world comes from Champagne, France? And that everything else that is champagne-like is called "sparkling wine" or something other than champagne? Wines, alcohols, farmhouse products and dairy -- including cheese -- are all protected under the AOC labeling by a branch of the Ministry of Agriculture called the INAO (institute National Appellation d'Origine). AOC stands for Appellation d'Origine Contrôlée‎, which translates as Controlled Designation (or Naming, to be very literal) of Origin. In other words, it can only be called by a certain name if it comes from a certain region and if it's produced in a certain way. There are currently 47 cheeses protected under AOC status, with about a half dozen more protected in more limited ways. That number is always slowly changing, however, as more cheeses apply for AOC status. The first of the AOC laws was put into place in 1919. Violating the law can bring on fines and even jail time. The first cheese with full AOC status was Roquefort, granted in 1925. The most recent is Rigotte de Condrieu in 2008. Interestingly, even some clearly very old, traditional cheeses were given their AOC status late (Camembert de Normandie 1983, Morbier 2000). Cabécou is, in fact, virtually indistinguishable from a Rocamadour. Same production method, same shape, same color, same texture, same taste, and same kind of goats in the same kind of conditions. But because it is made outside of the AOC regulations (in this case within the same general region of the Perigord but not the approved towns), it cannot legally be called Rocamadour (pictured below, and which looks exactly like the Cabécou ). In the 1980s, producers of Cabécou de Rocamadour carefully submitted their dossier to INAO. They worked together for many years to determine the parameters and make sure the producers followed them meticulously. Bureaucracy being what it is (and French bureaucracy so much more so...), they were granted the AOC label in 1996, under the name of Rocamadour. So since that time, you can be sure than anything labeled Cabécou does not have AOC approval to be called a Rocamadour. That doesn't actually make Cabécou an imposter or a copy. The manufacturer could have been making Cabécou for just as long as a given Rocamadour producer -- and the Cabécou could be just as authentic, artisanal, high-quality, and delicious -- but if it falls outside the approved region or parameters in any way, it cannot be AOC approved.